Dr. Abraham Kovoor was a well-known crusader against superstition and obscurantism and the scourge of Satya Sai Baba and other godmen in India. In 1963, he threw an open challenge offering to pay 1 lakh Sri Lankan Rupees to anyone who could perform a paranormal or miraculous feat under fraud-proof conditions. He is the author of the books “Begone Godmen” and “Gods, Demons and Spirits”. His most famous Quote is:- He who does not allow his miracles to be investigated is a crook; he who does not have the courage to investigate a miracle is a gullible; and he who is prepared to believe without verification is a fool! ¨Skepticism or debunking often received the bad rap reserved for activities – like garbage disposal – that absolutely must be done for a safe and sane life, but seem either unglamorous or unworthy of overt celebration” -Stephen Jay Gould, evolutionary biologist in his foreword to the book, Why People Believe Weird Things, written by Michael Shermer. Dr Stephen Jay Gould’s statement is only partly true in the case of Professor Abraham Kovoor, the celebrated Sri Lankan rationalist, whose 30th death anniversary falls on September 18, 2008. While Dr Gould is right in saying that debunking is an activity that must be done for a safe and sane life, it was not considered as an unglamorous one – at least as far as Professor Abraham Kovoor was concerned. Professor Kovoor who took debunking as a full time activity after his retirement from his teaching job became extremely popular in India and Sri Lanka, the citizenship of which he accepted after leaving Kerala. He was a popular guest in radio talk shows in Sri Lanka. He had close association with Sirimao Bandaranayke, the then Sri Lankan president. 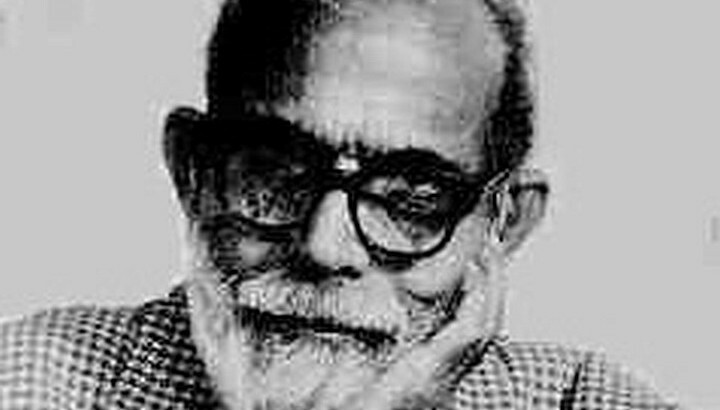 The Malayalam film Punarjanmam (directed by Sethumadhavan), which was based upon Prof Kovoor’s diary (Son and Mother) and in which he acted in his own role, was a box-office hit in Kerala in the Nineteen Seventies. Following the success of the film, it was remade in Tamil as Maru Piravi. The only two books (collections of his essays) which were published during his life-time (Begone Godmen and God, Demons, and Spirits, published by Jaico Books, Bombay) have never been out-of-print as of today. These two books have been translated into various Indian languages (Hindi, Kannada, Malayalam, Punjabi, and Tamil) and have been hits with the readers. Professor Abraham Kovoor was indeed a celebrity rationalist! Abraham Kovoor was born in Tiruvalla, Kerala on April 10, 1898 (Thus, in this year we celebrate his 110th birth anniversary too). His father, Rev. Kovoor Eipe Thomma Katthanar, was a Vicar General of the Mar Thoma Syrian Church of Malabar. After his education in Kerala and Kolkota, Kovoor took up teaching as a profession, first working in Kottayam Kerala for a short period and later in Sri Lanka. Though born in Christian family, he denounced Christianity in his adult life and became a rationalist as he “could not accept Bible as the word of an omniscient god”. Kovoor left Kerala, the land of his birth, and adopted Sri Lanka because “most of the Sri Lankans are followers of Gouthama Buddha who taught a more rational and tolerant philosophy than the founders of any other religion” (Page 7, On Christianity, Indian CSICOP, Podannur, Tamil Nadu). Though Prof Kovoor had been investigating paranormal claims for decades even while he was in service, it was only after his retirement in 1958, at the age of 60, that he openly came out challenging godmen and proponents of paranormal phenomena. That itself is rare in that many people who in their younger days are staunch atheists, marxists, and social revolutionaries often turn, in their twilight years, to ideologies and religious dogmas they denounced earlier. In Prof Kovoor’s case, though he had been an atheist and a rationalist throughout his adult life, it was during the last two decades of his life that he espoused militant rationalism. In the initial days of his activism, Prof Kovoor realised that his writings and lectures did not have the desired impact on the intended targets of his criticism a la godmen, astrologers, saints, yogis, etc. This prompted him to throw an open challenge to them. The first of his challenges was made in 1963 and was published in the Ceylon Daily Mirror on 17th June 1963. He offered an amount between Rs.1000/- to Rs.25000/-to anyone who can call correctly using his/her mystical powers the serial number on a ten-rupee currency note sealed in an envelope (Page 27, Exposing Paranormal Claims). The amount offered was subsequently enhanced to Rs.100,000/- along with the number of miracles challenged, which had by then increased to 23 items covering the entire gamut of paranormal claims usually made (See Appendix). Though his challenge was in force until his death in 1978, Prof Kovoor did not lose a single penny because of his challenge. On the contrary, he gained on a couple of occasions, when gullible followers of godmen accepted the challenge on their behalf by depositing the earnest money and later the godmen themselves failed to turn up! It is not only because of his famous challenge that Prof Kovoor became a celebrity but also because of his essays and lectures that were suffused with rigorous scientific analysis. His essays on life-after-death, rebirth and reincarnation – the pet topics of Indian paranormal-mongers -are splendid examples of his brilliance as a science educator. In the essay, “Do we survive death?”, he writes: ” I do not hold the view that my life is located in a particular spot in my body. Life is generated in all living cells in my body, and is sustained by the oxidatory chemical action which goes on in them. This chemical action is maintained by my breathing and blood circulation. It is not much different from the production of heat and light energies during the combustion of the hydrocarbon in a burning candle. Heat and light do no depart from a burning candle when it is put out, and return to it when re-lit. “It is just a case of cessation of chemical activity and production of energy. Similarly there is nothing to get out from my body when it dies as a result of termination of breathing and blood-circulation. If by any chance my dead body is resuscitated by some of the modern techniques, it will be wrong to think that the ‘departed life or soul’ re-entered the revived body. “My death will not be taking place abruptly at a particular moment in time. I began to die some 70 years ago. I started my life as parasite on my mother. About one-eighth of my body died in the form of the umbilical cord and placenta on the day I terminated my parasitic mode of life. From that day onward I have been dying as well as growing. While numerous cells in my body died daily, numerous new ones were born. Large quantities of dead tissues have escaped my body by way of cropped and shaved hair, peeled off skin, cut nails, dropped teeth, and the million of internal cells dead and discarded as waste during urination and perspiration. “The process of continued death will go on till the day when there will be no more cells left behind to multiply. Even after the death of all the cells in my body, the cornea of my eyes will continue to live in the eyes of a lucky stranger. “My last breath will not be any way different from the present ones. Then, as well as now, I shall be breathing out carbon dioxide and water vapour. “I do not believe that I have a soul or spirit to survive my death and go to heaven or hell, or to roam about as my ghost, or even to be reborn. It at all there is a soul, the major part of it should have escaped from me long ago with the large mass of dead tissues which have left meal ready; and even after the death of the present 125 pounds of tissues, a fraction of that soul should remain in the body of the stranger who would be receiving the corneal graft” (Page 41, Soul, Spirit, Rebirth & Possession). The Divine Miracle Exposure tours Prof Kovoor undertook in India in the 1960s and 1970s was unparalleled. He along with his team members directly confronted a number of prominent godmen in their den. The confrontation his team had with Sathya Sai Baba, the number one spiritual fraudster in India for decades, is memorable. After the Sai Baba failed to respond to Kovoor’s letters repeatedly requesting to have an audience with him, he informed the godman that he would be visiting the godman’s ashram at Whitefield in Bangalore. By the time Kovoor arrived, the godman had absconded and left for his ashram in Puttaparthy. Prof Kovoor’s campaigns also resulted in reinvigorating the rationalist movements in India. He infused a new vigor into the existing rationalist groups in India. It also resulted in starting new skeptic groups in various parts of the country. Undoubtedly, the skeptic movements in India are indebted to Prof Kovoor’s campaigns, lectures, and writings for what they are today. I, Abraham T. Kovoor of “Tiruvalla”, Pamankada Lane, Colombo-6 do hereby state that l am prepared to pay an award of 100, 000 Sri Lankan rupees to any one from any part of the world who can demonstrate supernatural or miraculous powers under fool-proof and fraud-proof conditions. This offer will remain open till my death or till I find the first winner. Godmen, saints, yogis, and siddhas, who claim that they acquired miraculous powers through spiritual exercises and divine boons win this award if they can perform any of the following “miracles”. 1. Read the serial number of a sealed up currency note. 2. Produce an exact replica of a currency note. 3. Stand stationary on burning cinders for half a minute without blistering the feet. 4.Materialise from nothing an object I ask. 5. Move or bend a solid object using psychokinetic power. 6. Read the thought of another person using telepathic powers. 7.Make an amputated limb grow even one inch by prayer, spiritual or faith healing powers, Lourdes’ water, holy ash, blessing etc. 8. Levitate in the air by yogic power. 9. Stop the heart-beat for five minutes by yogi power. 10. Stop breathing for thirty minutes by yogi power. 12. Leave the body in one place and reappear in another place. 13. Predict a future event. 14. Develop creative intelligence or get enlightened through transcendental or yogic meditation..
15. Speak or understand an unknown language as a result of rebirth or by being possessed by a spirit, holy or evil. 16. Produce a spirit or ghost to be photographed. 17. Disappear from the negative when photographed. 18. Get out of a locked room by spiritual power. 19. Increase the quantity by weight of a substance by divine power. 20. Detect a hidden object. 21. Convert water into petrol or wine. 22. Convert wine into blood. 23. Astrologers and palmists, who hoodwink the gullible by saying that astrology and palmistry are perfectly “Scientific”, can win my award if they can pick out correctly-within a margin of five percent error-those of males, females, and living and the dead from a set of ten palm prints or astrological charts giving the exact time of birth correct to the minute, and places of birth with their latitudes and longitudes. I invite miracle performers like Satya Sai Baba, Pandrimalai Swamigal, Neelakanta Tathaji, Nirmala Devi Srivastava, Pujya Dadaji, Dattabal, Triprayar Yogini, Gtirudev Anandamurthi, Kamubhai, Chinmayanand, Acharya Rajnessh, Muktanand, Swami Rama, Swami Haridas, Sivabalayogi, Bhagavan Gnanananda, Gurumaharaj-ji, Maharish Mahesh Yogi, Hazarath Ali, Dr. Vadlaimudi, C. S. Teerthangar, R.P.Tiwari, Uri Geller, Ne1iya Michailova, Jeane Dixon, Sybil Leek and the numerous “professors” of astrology and palmistry, in India and numerous other gurus, swamijis, mahants, acharyas, andas, babas and bhagavans who have found fresh pastures and wealthier gullibles in Western Countries, to take up my challenge and prove to skeptics like me that they are not hoaxers.